Yucca is a rich source of steroidal saponins, whose extract acts as a natural surfactant or wetting agent. Surfactants work to reduce surface tension between water particles, which facilitates spreading. It also enables water to spread evenly through soil, reducing the presence of dry spots and water channels. 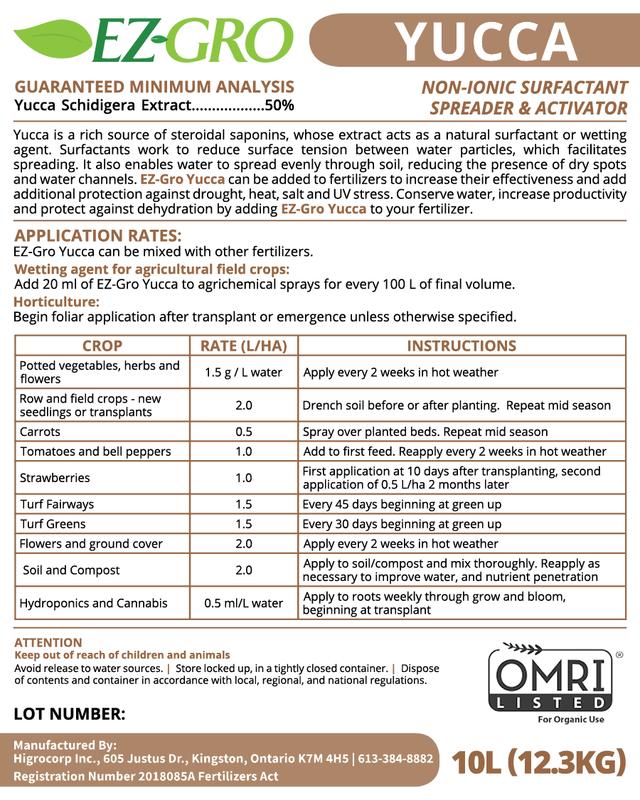 EZ-Gro Yucca can be added to fertilizers to increase their effectiveness and add additional protection against drought, heat, salt and UV stress. Conserve water, increase productivity and protect against dehydration by asdding EZ-Gro Yucca to your fertilizer. • Yucca is a natural surfactant and when added to biostimulants can increase their effectiveness and add additional protection against drought, heat, salt and UV stress. • Yucca acts as an effective wetting agent, reducing water loss amongst crops and cuttings. • It also enables water to spread evenly through soil, reducing the presence of dry spots and water channels.